Why are the Lucky Stars on the Official Gene Autry Website? Because they have excellent Cowboy Karma due to the fact that their lead singer, Sage Guyton, works with the Gene Autry artifacts in the Autry Museum's Collections department. 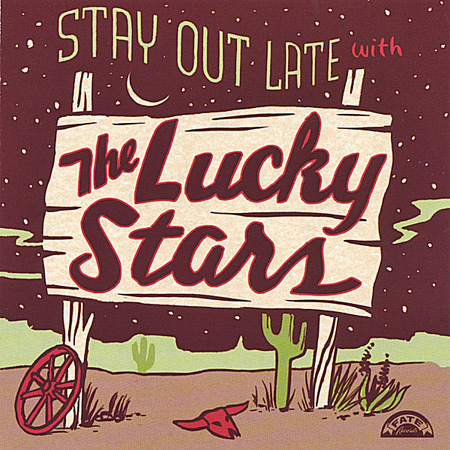 Perhaps you've seen the Lucky Stars perform at the Autry during their Sizzling Summer Nights events and know first hand that these fellows would fit right into a Gene Autry movie as the “musical sidekick talent.” If Gene Autry Entertainment had a house band, it would be the Lucky Stars! 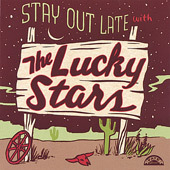 Cold on the heels of their first, highly acclaimed release "Hollywood & Western," comes the latest recording from California's popular Western Swing combo, entitled "Stay Out Late With The Lucky Stars." Four years of painstaking work in the studio, incredible attention to detail, and a whole lot of plain old laziness have resulted in this, their much-procrastinated second CD. What you get are thirteen sizzling new tracks which demonstrate the band's solid songwriting and impressive musicianship.